Patriarch Kirill of Moscow and Archbishop Anastasios of Albania exchanged gifts following con-celebrating the Liturgy in Albania on April 29th. From April 28-30, 2018, the Autocephalous Orthodox Church of Albania hosted His Holiness Patriarch Kirill of Moscow and All Russia. This first historical peace visit was of remarkable importance, as both Churches suffered through a harsh communist-atheist persecution. After the Doxology, Patriarch Kirill visited the Nativity of Christ Chapel and met with the Holy Synod of the Autocephalous Orthodox Church of Albania at the Synodal Center. On Sunday the 29th, the two Primates of the Churches concelebrated the Divine Liturgy at the Resurrection of Christ Cathedral in Tirana, with the participation of clergy from both Churches. During the Liturgy, Patriarch Kirill said, “Over the ages [the Church of Albania] served its people in the most difficult conditions; it was almost completely destroyed in the terrible years of the atheistic persecution, but rose again to carry its ministry for the people with new powers by the help of God.” He also noted that the fate of the Church of Albania is associated with the patronal feast of the Resurrection of Christ Cathedral and the name of Archbishop Anastasios, which comes from the Greek word anastasis, meaning resurrection. On Sunday evening, there was a festive concert at the Cultural Center of the Cathedral Complex. This event commenced with the presentation of the Russian language publication of His Beatitude Archbishop Anastasios’ book To the Ends of the Earth, a study on missions. Many of the chapters of this book are dedicated to the evangelization of the Slavic people by Saints Cyril and Methodius, as well as works of Russian missionaries in the Far East. In their speeches, the two Primates re-emphasized the idea that Orthodoxy, true to the commandment of the Lord and to her Tradition and history, is not complete if she does not engage in missionary work in today’s world to all people and all nations. 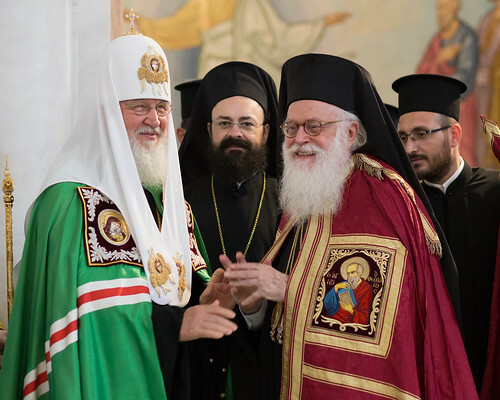 Patriarch Kirill congratulated Archbishop Anastasios as a missionary not of words, but for his efforts in the continent of Africa and in Albania, where the fruit of the ceaseless efforts he has made has been the revival of the Church from the ruins of her persecution and her continuous development. The program of the festival continued with religious and folk musical arrangements by the Shen Joan Kukuzeli Byzantine Music Choir and Children’s Choir from Gjirokaster. In addition, two young adult groups performed traditional Albanian dances. In conclusion, the Synodal Choir of the Patriarchate of Moscow sang. Following the concert, the Russian delegation and the Synod of the Orthodox Church of Albania went to an official dinner hosted by the President of the Republic of Albania, His Excellency Ilir Meta. On Monday, Patriarch Kirill and Archbishop Anastasios had official visits with the President of the Republic of Albania, Ilir Meta, and the Prime Minister of the Republic of Albania, Edi Rama. To conclude the visit, Patriarch Kirill and the Russian delegation visited the Monastery of Shen Vlash (St. Blaise or Vlasios) and the Resurrection of Christ Theological Academy in Durres. At the end of the visit to the Theological Academy, Patriarch Kirill and Archbishop Anastasios planted two cypress trees in the garden of the academy. This historical visit testifies to the miraculous resurrection of the Autocephalous Orthodox Church of Albania and emphasizes the unity of our Church. As His Beatitude Archbishop Anastasios constantly reminds the faithful of Albania: we are not a confederation of churches, but the One, Holy, Catholic, and Apostolic Church.